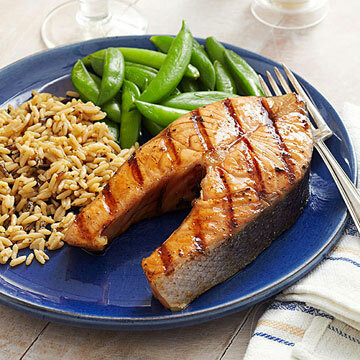 Although this recipe takes very little hands- on cooking time, be sure to allow an hour to marinate the salmon so it absorbs all the flavors of the sweet-and-salty marinade. Thaw salmon, if frozen. Rinse the fish and pat dry. Place in a plastic bag set in a shallow baking dish. In a small bowl, stir together the bourbon, brown sugar, honey, soy sauce, ginger, and pepper. Pour over fish in the bag. Close bag. Marinate fish in refrigerator 1 hour, turning occasionally to distribute marinade. Drain fish, reserving marinade. Grill fish on the lightly oiled rack of a covered charcoal or gas grill directly over medium heat. Grill 8 to 12 minutes or until the fish begins to flake easily with a fork, turning and brushing with reserved marinade once halfway through the grilling time. Discard the remaining marinade. This was good however it is to much bourbon.. While good on the salmon we like to take some of the marinate to put on rice, etc and well, it was just way to much bourbon for that. If I make it again I will cut that amount in 1/2.